Cook the asparagus until just tender, and you’ll hear a crunch with every bite, which creates a pleasure sensation. Crunchy food involves all five senses—you see it, smell it, touch it, taste it, and hear it—amplifying the pleasure explosion in your mouth. (For this reason, I suggest that you buy stalks of a medium thickness rather than the pencil-thin spears, which can easily overcook and lose their crunch.) If you want to make the wraps a one-dish meal, you can add some tofu or tempeh for a satisfying entrée. This wrap is also sturdy enough to be cut into two or three sections for an appealing party appetizer. The cashew spread is made with tamarind paste, derived from the sour tamarind fruit indigenous to tropical Africa and widely used by cooks in India and across Asia. The combination of cashews and tamarind bathes the asparagus with an epicurean blend of sweet and sour, and the ginger adds a mild spike of heat to get us through these final chilly weeks of spring. When you make the sauce, I suggest that you use a modest amount of salt and tamarind paste to start. After you’ve blended and tasted it, you can always add more salt and tamarind until the sauce has the perfect zing for your family’s palates. One caution: you might not realize how heating tamarind is because the sweetness of the cashews masks the tamarind’s intensity. A little goes a long way for people with pitta problems, most especially acid indigestion. 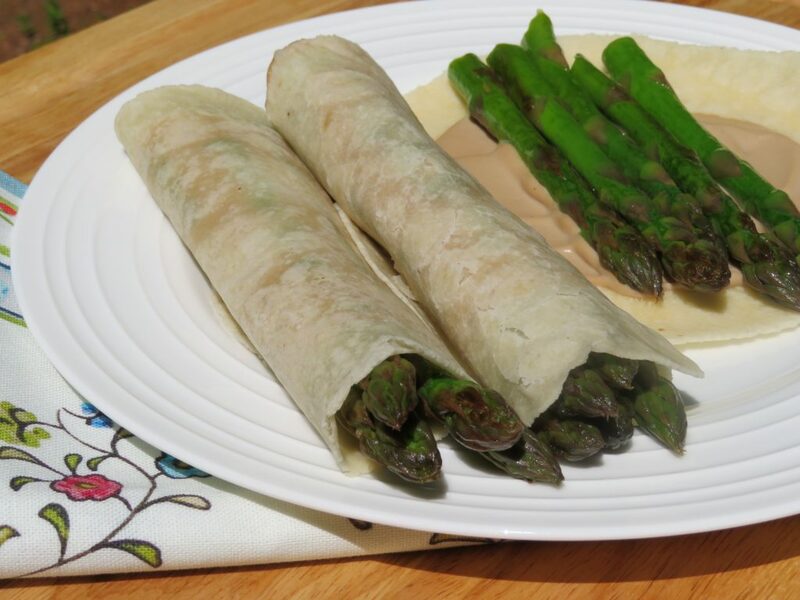 Enjoy cooking and serving these unique Vegan Asparagus Wraps to delight all of your senses! You can use any kind of tortilla, and if you’re gluten-free, I suggest the Siete Almond Flour Tortillas, which are made with a mixture of almond and tapioca flour. This is the best-tasting gluten-free tortilla I’ve found, and it holds up well when rolled. If you have a nut allergy, you may want to try the Siete cassava tortilla. You can fine the Almond Flour Tortillas and Neera’s Tamarind Paste at Whole Foods and many independent health food stores. You can also find tamarind paste in Asian groceries as well as online. Look for a pure paste, one made without chilies! 1. Make the Cashew Spread: Soak the cashews for 30 minutes to an hour in enough water to cover them, about 1½ cups. Strain the water and combine the cashews with the rest of the Cashew Spread ingredients in a blender. Adjust seasoning to taste. Set aside. 2. Rinse the asparagus in water. Break off the woody bottom third of each spear. 3.Heat a large sauté pan on medium heat for the asparagus. Heat a second non-stick pan on low heat to warm the tortillas. 4. Add enough oil to cover the large pan. When the oil is warm, add as many asparagus spears as will fit in the pan in one layer, and lightly salt them. Cover the pan and let them cook for 3 minutes, until just tender when pierced with a fork. Remove the spears and place them on a plate. Depending on the size of your pan, repeat this process to cook a second and third batch until all the asparagus are cooked. 5. While the asparagus are cooking, set up an assembly line to prepare the rolls with a cutting board, a plate for warmed tortillas, the cashew spread, a platter for cooked asparagus, and a stack of dinner plates or serving platter. 6. Warm tortillas on the non-stick pan, one at a time, for 10 to 15 seconds on each side, using tongs to gently turn them. 7. Prepare the wraps one at a time. Spread a tablespoon or two of Cashew Spread in the middle of each tortilla. Add 4 to 5 spears of asparagus on top of the spread with the tips of the spears extending about ¼-inch over the edge. Roll up the filled tortilla, and place it on a dinner plate or on a serving platter. Repeat until all the tortillas are used. If you wish, serve extra sauce for dipping. Add 1 tablespoon coconut sugar to this sour spread and use in moderation. Add a pinch of cayenne, and eat the sauce in moderation since cashews increase kapha.